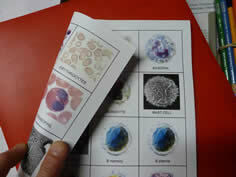 To review information about all types of blood cells, both red and white cells. There are four levels of clues, so the game can easily be played multiple times. 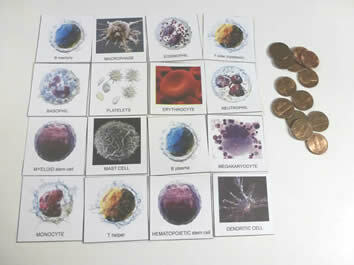 Also included are two “cheat sheets” that can be handed out to the players, making the game more of a learning activity and less of a guessing game (since the clues require remembering facts). One cheat sheet is a table of facts about leukocytes and the other is a flow chart showing cell lineage. This game is recommended as a review activity, not as a method of initial teaching. However, you might want to take a look at the cheat sheets and see if they are something you want to use during your teaching.